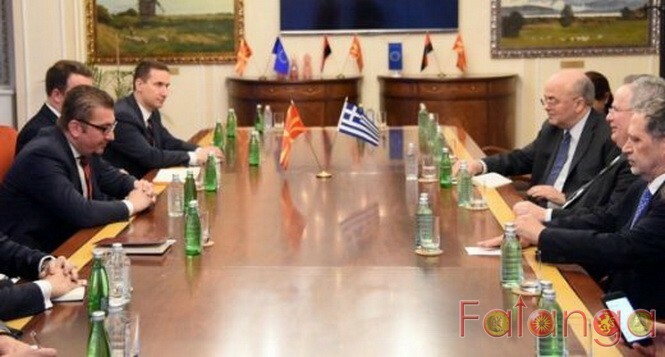 VMRO-DPMNE leader Hristijan Mickoski met on Friday with Greek Minister of Foreign Affairs Nikos Kotzias..
Mickoski emphasized that VMRO-DPMNE supports developing good neighborly relations, based on sincere friendship and mutual respect. Macedonia and Greece should have a common interest and enhanced cooperation in many fields of interest to the citizens of both countries, economically and politically. The President of VMRO-DPMNE Mickoski pointed out that the Republic of Macedonia must continue its Euro-Atlantic agenda and the process should be unblocked. It will also contribute to the integration and stabilization of the region through enhanced cooperation within the framework of the global structures that the Republic of Macedonia naturally belongs to. At the meeting, President Mickoski affirmed the official views and positions of VMRO-DPMNE related to the name dispute. At the meeting, VMRO-DPMNE expressed concern about certain steps in the Greek society that irritate and incite negative feelings towards the Republic of Macedonia, and they are not helpful to the overall process. VMRO-DPMNE also stressed that the solution negotiated by the Macedonian government should respect state and national interests, reads the statement of VMRO-DPMNE.